A balance of good value and understated practicality - go try one. Simple lines. Full sound. Great playability. The absence of a second strap button. Most bass players have a healthy regard for well-built guitars, particularly when it comes to acoustic instruments. We admire the weight, portability, sounds and looks, and naturally desire something similar in our own field. But even when some of the best manufacturers tackle this issue, the results can often be disappointing. The designs can suffer from ungainly size, disproportionate appearances and a simple lack of practicality, added to which there is an inherent problem with amplifying these beasts. Larrivée is one of the most highly regarded manufacturers of acoustic guitars today and one of the latest additions to its Recording Series is this B-03RE 'acoustic' bass. It's modelled on the existing D-03 guitar and first impressions are positive: a shapely design with a small and simply styled headstock and no cutaway to the body - super clean and very easy on the eye. A light-coloured Sitka spruce top with subtle concentric-line soundhole decoration is married to dark rosewood back and sides - all solid woods at this price, of course. The neck is mahogany and attaches to the body with a traditional glued dovetail, the fingerboard is ebony, bound and adorned with tiny pearl dots. Ebony is also used for the headstock face, while the bridge features a compensated Tusq saddle and keyhole-shaped slots to anchor the ball ends of the strings. 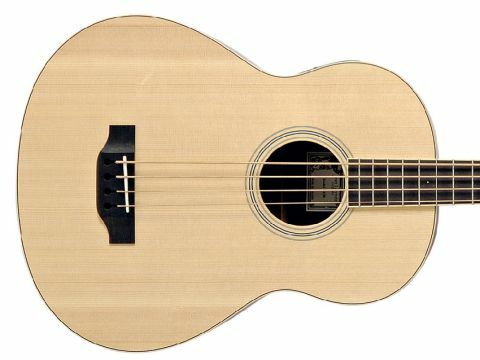 Acoustic bass guitars can be unwieldy, but with its diminutive headstock, sealed gear tuners and manageable proportions, the playing experience is extremely positive. The looks may be considered understated but for the on-board electronics, Larrivée has chosen to use the LR Baggs Element Notch System, which features the Element undersaddle transducer connected to the preamp. This unit offers a great deal more than the standard bass, treble and volume sliders (although it has those too, of course) by way of a feedback-busting phase switch and a narrow-band notch filter, plus a mid-range 'tune' rotary that lets you select a particular frequency to cut or boost. It also has an LED that lets you know when a battery change is required. To do this you simply press on the preamp unit and the module pops out to make the batteries easily accessible. For those unfamiliar with amplifying acoustic basses, let us explain the feedback problem. The resonant qualities of a large, hollow-bodied instrument produce a lot of vibration in use, and this excites the pickup transducer. The better the acoustic properties are, the more unwieldy the instrument can become at high volumes. At worst it can produce a runaway feedback problem that's tricky with guitars but - due to their larger proportions - can be a nightmare with basses. To combat this problem, LR Baggs has produced its Element Notch System and it's a brilliant tool that greatly reduces the chances of feedback. Simply hit the phase switch, which should cure most of your problems, then rotate the notch control until the offending frequency is isolated and effectively dealt with. As this is operating on a very narrow band, the system is able to keep things under control without dramatically altering your whole sound. As with any acoustic instrument fitted with electronics, this has two very distinct and different voices available. In order for it to be a truly worthy contender it has to sound great in both modes. Here, the unamplified, natural voice is full and wholesome with a robust bottom-end that's powerful and very responsive. It's also notably loud. Given the sophistication of today's electronics you'd expect a high-quality reproduction of the natural acoustic sound of the bass and this doesn't disappoint. Even with all these features, the module is very well thought out indeed, and is more than capable of producing a much wider variety of sounds than the acoustic nature of the instrument may convey. The output from each string is very well balanced and the sheer penetration of the bottom-end is stunning. But there's also a degree of punch and a purity that will surprise many a player. For something so friendly to play, this has quite a bite if you fancy giving it a push - even the hardened rocker will find much here to test their 'metal'. A great natural voice when amplified with the potential to nail a lot of subtly different voices. The Larrivée B-03RE is a very well conceived instrument indeed and, although acoustic-bodied basses are often accused of not being the most comfortable to play, this is actually one of the best we've tried. It's most comfortable played seated (Larrivée only fits the bottom strap button/ jack socket, so it seems to agree). This is one of the most rewarding acoustic bass guitars that we've ever had the pleasure of reviewing. It might be the largest acoustic instrument that Larrivée makes, but it doesn't feel unnecessarily big. It offers a good clean playing action and great intonation and the mahogany neck feels slick and very manageable. Okay, it's not a cheap addition to your bass guitar collection, and there are loads of cheap 'n' cheerful electro-acoustic bass guitars in the current market for the occasional user. But if you're a serious player who wants both high quality acoustic and plugged-in electric sounds, plus all the build quality and playability that Larrivée is justly renowned for, the B-03RE has to be a good place to start your search.